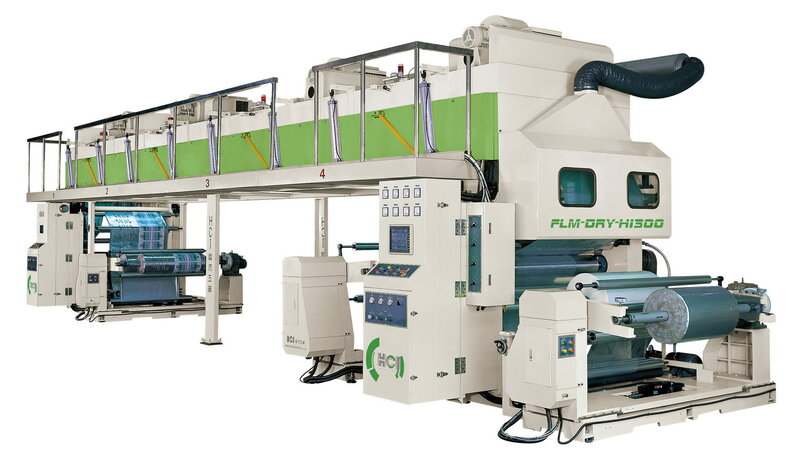 Dry Laminating Machine(FLM-DRY) - HCI Converting Equipment Co., Ltd. The FLM Dry Laminating Machine is specially designed for roll laminating operations of flexible packaging materials such as BOPP, CPP, PET, PE, Nylon, Aluminum Foil, and a variety of multi-layer films as well as performing surface treatment. This dry laminating machine is designed for great production efficiency at a lower investment level. The machine is very easy to operate and can be easily used by those with printing machine operation skills. The synchronized motion of the film laminating and gluing devices is of a non-shaft design which fully eliminates accumulated tolerance and facilitates the movement of both semi- and fully-completed products. Lift-up & floating type unwind stand with 3" air shaft providing the most convenient operation. Auto roll exchanging is achieved by motorized turret rotation mechanism. And the material splicing device increasing the work efficiency. Adopted edge guider system ensures the coating position accurately. The unwind tension is sensed by load cell and compared to the set value. The control system will increases or decreases it according to the calculated differences automatically. Gravure coating roller incorporated with reciprocating doctor blade assures extremely uniform coating thickness and surface smoothness. Equipped with coating pressurized rubber roller & glue tank with pneumatic ascend / descend device. Coating section also equipped with LCD touch screen. It is convenient for machine pre-run settings such as glue adjustment; hot melt temperature setting, doctor blade movement and gravure coating roller cleaning. Four zones and straight dryer provide superior drying performance when dry laminating machine running. Equipped with hot oil circulating roller and water cooling roller ensure the laminating quality. Laminated roll auto exchanging is achieved by motorized turret rotation mechanism. Equipped with auto web cutting device for continuous production. The rewind tension is sensed by load cell too. 10.4" LCD colorful touch screen and simple figure display for setting. Solvent auto circulating conveyance system. Center guiding type web guider for secondary unwind stand.